BioBag products reduce climate change gas emissions; CO2 is absorbed from the atmosphere and O2 generated during the growing phase, a positive contribution to the reduction of climate change emissions and the carbon footprint. Also saving the consumption of energy and non-renewable resources (petroleum) when compared to alternative products. BioBag’s use raw materials of agricultural origin, creating products fit for purpose; these are then returned to the soil from where they came, completing a natural, virtuous cycle; referred to as Cradle to Cradle not Cradle to Grave. 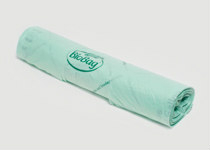 BioBag’s are certified compostable in home and commercial composts and may be placed in a green waste collection. 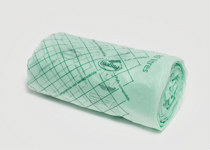 The Mater-Bi material breaths so CO2, O2 and water vapour transmission rates are high making bags very suitable for keeping produce fresh, no sweating with food or skin contact applications. 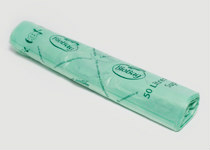 They maybe used for food contact applications with high resistance to fats, oils and acidic foods. Safe for animal feed like worm or pig farms, even sea creatures can digest BioBag’s. The decomposition rate depends on bacterial activity, the temperature and the moisture level; in hot quality compost BioBag’s will decompose much quicker than the international standards (180 days) with no polymeric or toxic residue. 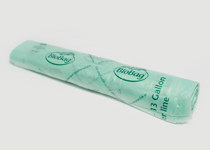 The shelf life of BioBag products is approximately 1.5 years from the manufactured date, they will look the same after this period but will gradually loose strength as they biodegrade. As biodegradability depends on: 1) Temperature. 2) Moisture. 3) Microbiological activity and 4) Light exposure, it is best to store BioBag’s in a cool, dry, dark place. All BioBag products, including the inks or dyes, are fully independently certified to many international standards including European EN13432, American ASTM D6400 and AIB-Vincotte ‘OK Home Compost’. BioBag International and BioBag Production are audited by AIB-Vinçotte International and are ISO accredited according the requirements of EN ISO 9001: 2008 “Quality Management System” and EN ISO 14001: 2004 “Environmental Management System”. This 10L liner fits the Tall Air bin. 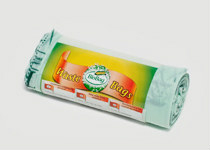 BioBag bags replace plastic and can be disposed of in composts or green waste collections. They can be used in organic farm production and food contact applications. Manufactured from Mater-Bi; the first family of bioplastics that use vegetable components such as starch, cellulose and vegetable oils and biodegradable polymer and natural plasticizers, all crops used are non-food origin. Also some of these crops are grown to assist in remedial land recovery. To be more specific, the oils are from weed seeds grown on marginal wasteland in a European Union country and specifically no Palm oil. All grades are compostable and biodegradable during composting and include sustainable and renewable resources. A popular size for most standard kitchen bins. 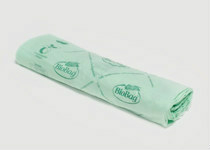 BioBags replace plastic and can be disposed of in composts or green waste collections. Ideal for use in organic farm production and with food contact. Manufactured from Mater-Bi; the first family of bioplastics that use vegetable components such as starch, cellulose and vegetable oils and biodegradable polymer and natural plasticizers, all crops used are non-food origin. Also some of these crops are grown to assist in remedial land recovery. To be more specific, the oils are from weed seeds grown on marginal wasteland in a European Union country and specifically no Palm oil. All grades are compostable and biodegradable during composting and include sustainable and renewable resources. 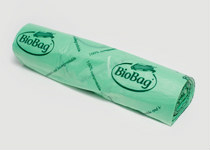 BioBag bags replace plastic and can be disposed of in composts or green waste collections. They can be used in organic farm production and food contact applications. Manufactured from Mater-Bi; the first family of bioplastics that use vegetable components such as starch, cellulose and vegetable oils and biodegradable polymer and natural plasticizers, all crops used are non-food origin. Also some of these crops are grown to assist in remedial land recovery. To be more specific, the oils are from weed seeds grown on marginal wasteland in a European Union country and specifically no Palm oil. All grades are compostable and biodegradable during composting and include sustainable and renewable resources. 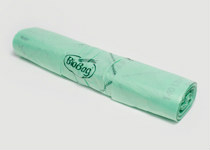 BioBags replace plastic and can be disposed of in composts or green waste collections. They can be used in organic farm production and food contact applications. Manufactured from Mater-Bi; the first family of bioplastics that use vegetable components such as starch, cellulose and vegetable oils and biodegradable polymer and natural plasticizers, all crops used are non-food origin. Also some of these crops are grown to assist in remedial land recovery. To be more specific, the oils are from weed seeds grown on marginal wasteland in a European Union country and specifically no Palm oil. All grades are compostable and biodegradable during composting and include sustainable and renewable resources.